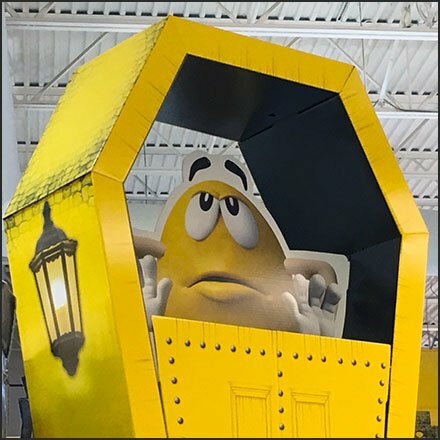 Normally not scarey at all, this M&M’s Coffin Case Halloween Display allows Yellow (Yes, the character’s actually name) get with the Holiday theme. Admittedly Yellow looks a bit perplexed at the situation he finds himself in, but the Holiday mood is communicated instantly. I plan to make note of the fact that inexpensive corrugated coffins like this exist to save on my own funeral expenses. Thanks for the idea, Yellow. This M&M’s Coffin Case Halloween Display seen at Giant, Bartonsville, in the Pocono Mountains of Pennsylvania. “Eerie Merchandising Pinterest Board” for a visual summary.